Dedicated to infrared photography, the 52mm IR Dark Red 092 Filter from B+W is a specialized filter for both digital and film photography. It has a nearly opaque, dark purple appearance when held to light, and is designed to block all visible spectrum light up to 650nm. To produce surreal effects, the 092 filter allows only 50% of light pass just below 700nm, and from 720-2000nm more than 90% of IR radiation passes. Since most infrared films are sensitive up to 1000nm, this transmitted red portion of the spectrum still affects the exposure. Due to the nature of infrared photography, the filter factor for this filter is highly variable and depends largely on your film sensitivity and lighting conditions. This specialized filter is uncoated and uses high-quality Schott glass for its construction to maintain imaging integrity and optical clarity. It also features an F-Pro brass filter ring for durability as well as jamming prevention. Used for infrared photography applications with digital cameras and specialized IR films. Blocks all visible light up to 650nm while allowing greater than 90% radiation transmission between 730-2000nm. Variable filter factor depending on your film sensitivity and lighting conditions. 52mm IR Dark Red 092 Filter is rated 4.5 out of 5 by 6. Rated 4 out of 5 by Jack from Some nice results I purchased this filter to do some infrared digital photos. I got some good results with a Nikon D-50 and not so good results with the Nikon D-200. This was expected however (it is designed to block more IR). The D-200 requires a bit more post production work. Overall, I like the filter and I am anxious to do more with it. Rated 4 out of 5 by Ironman from Bring back the fun of film photography. I needed a special way to set my photographs apart from all the other digital photographers. Thanks to the Dark Red 092 filter I could push myself creativly and think like a film photographer. Shooting in bulb mode is such a fun part of being a photographer. Taking pictures blind was frustrating at first, then, when I saw the picture ( no pun intented ) on my digital camera I knew that I had discovered the joy of photography. Rated 4 out of 5 by Chris O'Steen from Makes great images I purchased this filter to explore infrared photography for a final school project. 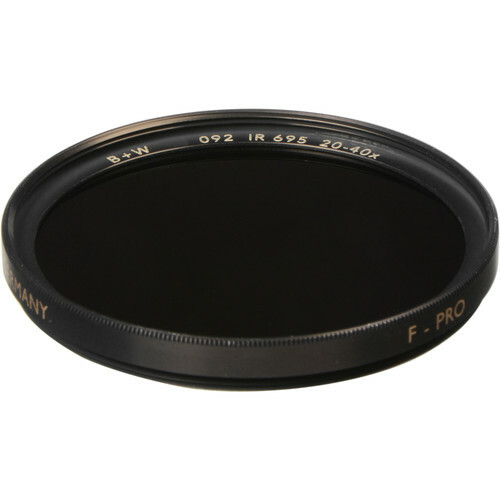 This filter was very effective at blocking visible light and allowing only the infrared wavelengths to expose the film. This filter has an excellent fit and finish, and screws easily onto the lens of my camera. Rated 5 out of 5 by ugaprof from Good match with Canon 60Da Works well with the Canon 60Da (astronomy extended-red camera) for daytime infrared photography. Image is vivid red and can only be previewed with Live View because you can't see anything in the viewfinder. You should combine the reviews of the different diameters of this filter. Rated 5 out of 5 by Mike from I will buy this again and again This is one item of many for one of our products We will keep buying more and more of these.